We have constantly been amazed at the great creative actions of humanity, which can be seen in their key inventions and major evolutionary steps that shaped human civilisation and these have been initiated by generations of unknown creators over time immemorial. These creators have helped shape our civilisation through their breakthrough contributions by daring to experiment and create in the face of social isolation and ridicule by the prevailing orthodoxy. They contributed by innovating at the edge of society as stated by Alexander Doxiadis when he talked about the blue dots and red dots that represented the typical settlements where the blues were the majority conformists and the reds the crazies who were ostracised and isolated till a paradigm shift in society helped assimilate the thoughtful and insightful contributions from these isolated creators. These contributions included small or major improvements and change in processes, tools, arts, crafts, everyday artefacts, houses and public structures which we have conveniently labelled as inventions and innovations long before we could recognise these contributions as heroic acts of design thought and action. We now know that these are early design acts that were not properly attributed in our historic references so far. 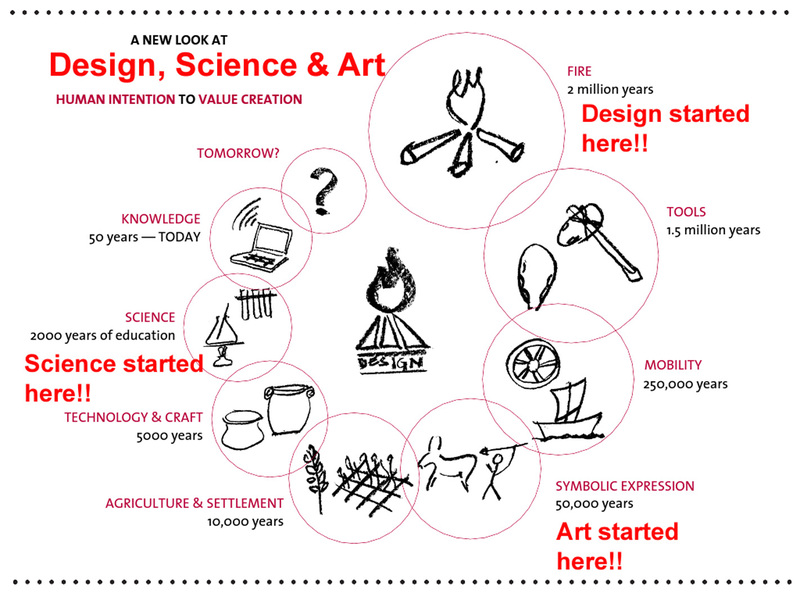 We are now beginning to understand that design thought and action was central to all these breakthrough contributions and that it is a basic human activity and ability at one level that is as old as civilisation itself. The other form is a new and modern profession, and this is created by the professional education of a designer who would be able and sensitised to feel, think, act in an appropriate manner in a rapidly changing material and social world in an industrial age. Today in an era of information access and digital processes has brought on new possibilities for design as well as enormous challenges and responsibilities that require an ethical and feeling attitude alongside a sharp intellect and able set of hands. 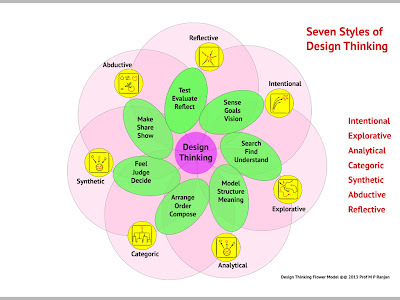 Understanding design and design thinking today is a major challenge since it has so many forms and those working in a variety of domains exhibit capabilities and competencies drawn from a vast array of traditional disciplines that have been integrated into the skill sets of a particular designer in his or her modern form. University education has become dominated by vertical specialisations with little connect between the various disciplines and the emphasis has been on development of knowledge resources and capability within each domain of study. However it is increasingly seen that to solve real world problems and emerging opportunities there is a need for interdisciplinary and transdisciplinary attitudes and abilities to collaborate and think across various styles of thought and action to ralise innovative possibilities that are around us all the time. It is here that many educators across disciplines are turning to design thinking to bring these new attitudes and capabilities to the various domains of specialisations within an educational and university setting. The core processes and capabilities afforded by design thinking training are listed and stated below. Learning to understand the context and the social, cultural, material, economic and political situation that usually leads to trying to get clarity from a very complex set of signals and processes from the real world that help provide the essence of a direction for design thought and action. This kind of learning, like many others, does go through several iterations but at the end of these multiple cycles the level of conviction and sense of purpose is usually very high in the task and the purpose that it represents. This early stage learning is at most times very fuzzy and a great deal of flexibility is called for to be able to cope with the ambiguity that accompanies this kind of design exploration leading to the building of some convictions that are supported by the faith of these experiences. Many a times this conviction can be a source of great frustration since few others have the same insights that the design learner has garnered from the unique situations that has been investigated in some considerable depth. Designers learn that these early stage sense data needs to be trusted and not abandoned too early and this is the foundation of an innovation environment in which they choose to work. Lifetime of experiences are harnessed through the processes of brainstorming and mapping of the context and the various elements that may impact the situation that is being examined with a very open minded attitude that is inclusive in nature rather than by being overly critical. All this exploration is done with words and images and these need to be modeled in a composite structure that captures both the structure as well as the form of the situation under examination and this model is a dynamic one as it develops and responds to new circumstances and information and insights. Insights about the context and the particular situation are the most sought after by-products from these early stages of design exploration. Design learning needs to develop both attitudes as well as ability with tools of information access and processing. The process of design deals with access to information to many classes of information types which includes published and reported facts and speculations and also field based observations and self initiated experiments that are contextually mediated to fill gaps in the current information or for a direct confirmation of some reported fact or speculation which cannot otherwise be verified easily, to list only a small sub-set of the huge variety of information types involved in design investigation. Designers have drawn from all kinds of disciplines, from the humanities, sociology, psychology and language studies as well as from the sciences and technology fields, various tools and techniques that were previously perfected within these disciplines over the years of specialised investigations and these would be available in published form as textbooks from each field of study. For example, tools and procedures on field-work and observation of people in the particular design situation, are drawn from the standard practices and work ethics and techniques of anthropologists, sociologists a variety of humanities experts and these have been adopted and used in numerous cases of design research that I know of. The field of design research is growing with many of these disciplines recognising new roles for themselves in the whole arena of innovation and design action that is becoming recognised as a valuable area of work globally. Design schools too are beginning to adopt many of these tools and processes as their own and building competence in their use and analysis. The purpose of these design research efforts however tend to be focussed on finding useful insights for the design action and decisions to follow rather than be focussed on finding fundamental truths and new knowledge as a final goal of the particular design research effort. Design problems are better understood by juxtaposing factual and observational findings with new proposals and imagined possibilities that are visualised at an early stage in a what if mode of thought and action. New scenarios for action come up for active consideration and these also inform the design teams about the possible gaps in their information that need to be filled as they move forward. These conjectural models can be subjected to early analysis using a variety tools and frameworks to conduct such analysis. The hypothesis and insights arrived at in these early explorations drives further design investigation in the form of advanced scenarios of parts or the whole of the design situation or in the form of narratives and stories that cover both the micro and the macro levels of observation and visualisation of the stated and imagined need as well as the consequences and potentials that are being investigated by the designer. This too moves through numerous iterations till a selection is possible of a few major alternate courses of action that can be taken to the next level of investment planning and decision cycles, be it the sharing of these models with stake-holders, conduct of further focussed experiments or the building of expensive prototypes of parts or the whole product or business offering, as the case may be. This also applies to visualisations at many levels of expression from the abstract to the real, such as pre-cognitive diagrams, doodles and fuzzy sketches at one end, that are the preliminary visualisations created in many cases intuitively by the designer for themselves in the search for possible configurations and relationships of the various attributes of the solution to the other extreme involving expensive articulations of scenario in the form of detailed drawings, renderings and models and even real material prototypes in many iterations in a search for new and particular configurations affordances that resolve the many contradictions that exist in all design tasks. We can call this an analytical exploration of the design situation using visual tools and processes that generate external models rather than numerical or verbal expressions, although in some cases even these would be used in conjunction with the visual as well. Many of these models can be shared with large groups of critical participants to find gaps in the offerings and areas of improvement may emerge from the suggestions that are gathered in this process. Designers need to develop an ability to make their concepts visible at an early stage and to be successful they also need to be able to communicate these effectively to a wide range of stake-holders as well. The ability to work in a team situation with many stake-holders with different areas of expertise is critical and using verbal, textual and visual discourses is an integral part of design thought and action. Design action calls for articulate expression of intermediate findings as well as expressive presentations of findings and results of concept explorations along with justifications of investments that would need to follow to make the concept a reality. Therefore, interactions with numerous stakeholders and in most cases approving authorities with whom the interactions are both critical and necessary for the task to progress to the next logical level of action with funding and other supports, calls for fairly advanced skills of communication and language use along with multi-media presentation skills. The learning involved is in communication, in seeking collaborations and in understanding the responses with empathy to the situation and the needs and feelings of the identified users. For major projects of public utility there is the added complexity of public discourse and politics of governance that would need to be negotiated and navigated with competence if the design teams are to be successful. Values and ethical positions are a part of all design choice making and these would come up at numerous stages in the process of design. Learning to accept and process the feedback from stake-holders into contact with constructive actions is a great leveller, and it brings the design thinker into uncommon scenarios on the cusp of great change and this could induce change in the individual themselves, since some of this feedback could be cultural in nature or outside the accepted frame of the designers frame of “personal ethics” – for want of a better term, which may be reflexive and transformative in both directions. The nature of design calls for the practitioner to be widely informed about both technical as well as socio-political matters and be able to use these in the context of the task at hand. There are many instances of the designer embarking on a new path outside the scope of the current task based on the insights and convictions derived from the learning experiences embedded in the design task. Today we are finding numerous examples of great complexity that may contain challenges of trying to bring sustainability and social equity into design tasks that may have in the past been considered a pure technical exercise. Awareness levels are high and public participation in such matters is also approaching high levels compelling designers to adopt methods that could make the design process less intuitive and more accountable and with public visibility at all decision stages, particularly for good governance in public expenditure. Documentation in such situations becomes doubly important. 6. Exploring Alternatives: Developing Strategies and Details for Parts and Whole. Learning to design leads to be open to vast range of alternatives and in decision-making choices from out of the numerous alternatives of parts and wholes that are the result of progressive visualisations and experimentations conducted in the progress of the design task. The definition of the task itself is open to review and many a times the investigations and design investments have veered of into an entirely new direction as a result of this kind of review which is quite normal in a design situation that is complex and previously less explored. The ability to develop alternatives calls for flexibility as well as the ability to generate prolific variety of expressions that can shape possible futures through the mobilisation of many types and styles of thinking for exploration and synthesis. 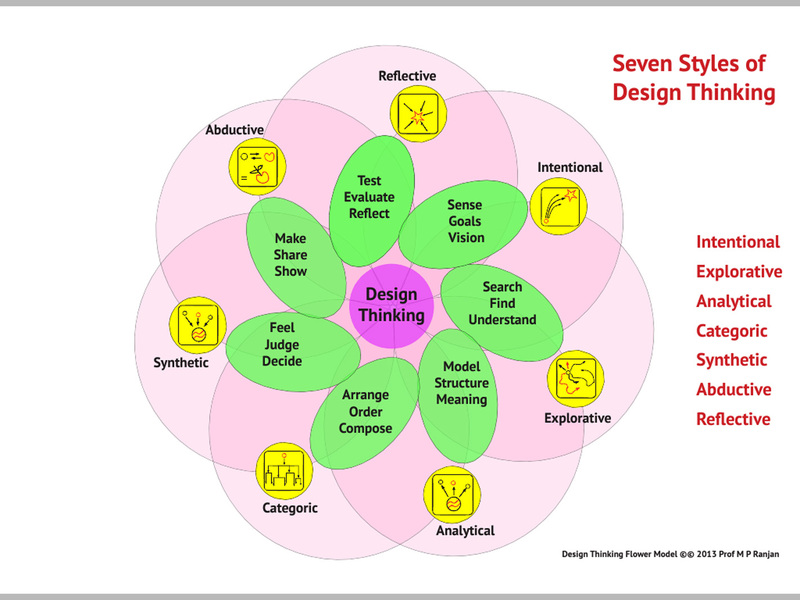 Design thinking has many modes of thought from explorative, analytical, synthesis, abductive, categoric as well as reflective thinking styles at various stages as the work progresses. Design students need to be curious people and they should have an urge for constant learning about changes in their environment as well as in society at large. The ability to find what is not known and to quickly learn the principles or alternately to find those who can help them learn is a quality that is valued in a design and education setting. The constant self development that we see in what designers do in their search for new and interesting bits of knowledge that would be of value in the future on some not yet anticipated task usually within the frame of interest paths that each designer traverses over a career of continued learning to cope with the new and the unexpected in their usual area of work and areas that overlap their multiple interest paths. This calls for high degree of self-motivation and a sustained level of interest that can be supported when the task becomes both difficult and in many cases frustrating when no progressis easily visible on the horizon. The attitude towards learning is one of curiosity and with a constant search for excellence and quality in whatever is being addressed. Pre-Requisites: Offered to all students of Undergraduate and Postgraduate Programme at Ahmedabad University. Objective: Broad based introduction to the processes and concepts of Design Thinking with a sensitisation to attitudes and action skills required to innovate and deliver new and compelling design concepts. Participants will be introduced to various processes and styles of Design Thinking using selected real world settings in the City of Ahmedabad — to explore, understand, structure and build new products, services and systems with the use of design and innovation processes. Help participants appreciate design thought and processes with a familiarity to key design thought leaders in the field through select readings, contemporary debates on issues and perspectives as well as online resources that are relevant and current. The assignments will give students an exposure to the hands-on minds-on perspectives needed for handling complex and wicked problems that are typical of design challenges and these collective experiences as well as reflections on these actions taken together will give them confidence to handle new and unfamiliar situations and use these processes and styles of thinking to create new and compelling offerings using design thinking as a way of living and action. Methodology and Structure: This 30 session course is divided into 10 modules, each composed of lectures, discussion sessions on the Key Theme of each module and these are followed by structured non-prescriptive assignments for the students to work in teams to explore and discover the boundaries of the chosen task and navigate the complexities of the situation in exploring design opportunities through the set of structured assignments and learning to work in teams at the same time. These are broad sectors within which there would be numerous specific design opportunities worth doing and these would be explored and developed as a theme each year depending on the context and current interest of the participating students and the imagination that they would unfold. And many more which would be developed as part of the early Goal Setting assignments in the early phase of the course. Space and Facilities Required: Flexible space planning with appropriate furniture and lighting would be needed to conduct he various parts of this course. Lectures and presentation sessions would be for the whole group and depending on the total number of students the space requirements would need to be made appropriately. During each Module the groups would require access to lecture spaces provide with audio-visual facilities as well as clear wall spaces with white soft boards for display and discussion of posters simultaneously for at least five groups. Each group would be composed of 6 to 10 student participants and the class strength could vary from 30 to 50 participants each year. Each group would need a work space suitable for group processes in design thinking and preferably these tables and chairs should be stackable to clear the space for group presentations that would use the wall space around the design space. List of key thought leaders and published resources: Design Thinking is a rapidly evolving field and more published resources are being made available each day as the field grows. We will keep a close watch on the evolving literature and suggest appropriate papers, books, web sites and discussion lists that the students can interact with as part of their course at the University. Being an introductory course, the selection will be governed by the material being suitable for entry-level students into the field of design and design thinking. However the University needs to invest in expanding their design related library so that these students can continue to use the resource long after the course in a continued learning setting and it would also encourage other students to think about using design as a key resource for their own projects and initiatives. We anticipate many such innovation initiatives from the student body once the course is set up and finds a place in the mainstream of the University offering. Evaluation Criteria and Feedback: Students will be evaluated on both participation as well as performance. Participation will be on the basis of attendance and quality of participation in group processes. Results of group assignments will be graded for the group and not for the individual student. However, students not showing interest or effort in group processes would need to be counseled to ensure a level of learning that is wholesome and properly assimilated. The final presentation would be a public event and the concepts developed by the students will get live feedback from teachers, mentors, peers, as well as members of the community with whom they have interacted during the course. Attendance and individual participation tasks will carry a 40 percent weightage while group tasks would carry 60 percent. Learning Outcomes: Understanding of Design as an action discipline. Ability to frame complex challenges using design thinking skills and visualization of these for sharing with stakeholders. Familiarity with design concepts and tools with an introduction to key thought leaders. Familiarity with a vocabulary of design and innovation as they would be applied to a wide spectrum of opportunities and complex challenges. 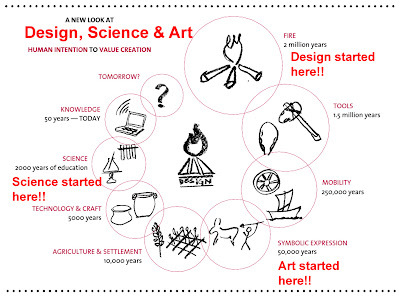 On 18 August 2013 the Academic Council of Ahmedabad University reviewed the proposal and accorded an in-principle approval to launch the course as an elective offered across several colleges of the University, This is a significant move since in India we have over 500 recognised Universities and the need for embedding design and design thinking into the 230 sectors of our economy is still a long way away, a journey that we started on this blog in 2007 on 14th June with the publication of our Mission Statement for the Design for India initiative.